You all know that I LOVE me my morning runs. But with this new higher mileage plan, along with this work-family-life and needing to sleep thing, it is difficult to fit all of the miles in pre-dawn. And it gets a bit tiring (literally) to wake up at 4:30 and do lap after lap after lap around the hood. So when I saw that the forecast for today was 60 and partly sunny, I decided to treat myself to an hour extra sleep and a run in the afternoon. I’m SO glad that I switched things up, because I ended up running at a hidden gem of a park that I’ve never been to, even though it is literally almost half way between my house and my work and I pass within a mile of it every day. Lake Rebecca Park Reserve, one of the Three Rivers Park District parks. It was awesome! About 8 miles of paved trails that are rolling hills through woods, fields and by two little lakes. The rolling hills are longer and more gradual than my usual hilly loop at Baker Park Reserve, but they are constant. I felt like it would be a good place for Boston training (not same grade, I’m sure, but in that they are constant ups then downs then ups then downs). The park was practically desserted, even though it was the warmest day we’ve had in quite awhile. Very peaceful. My new hidden gem of a park! I ended up with 10 miles at 9:12 pace. Perfect way to spend my afternoon! Not so perfect was Meg’s track meet. She was in tears after her event (4×800 relay, which was run in the craziest way ever; like 60 girls all ran at once; there were so many of them going that I literally couldn’t even see Meg. Ugggg.) because she came in last place and all of the girls who goof off and skip practice came in ahead of her. She is frustrated with that. I tried telling her that as long as she is having fun and enjoying running and the effect it has on her mind and body, that that is all that matters. But she was still sad. Race season seems to be officially starting this weekend! Mindi is running Eugene Marathon. Kristy is running the New Jersey Marathon. Good luck, ladies! There are a gazillion local 5ks, 10ks, etc. this weekend. Wish it fit in my schedule to do one of them, but there are a crazy amount of kid activities, so I’ll just need to get my runs done on my own. 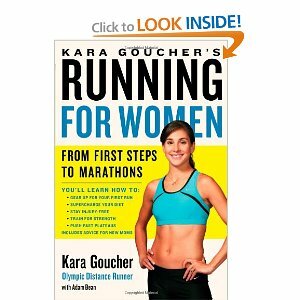 I bought Kara Goucher’s new book. Anyone read it yet? Looks like it will give lots of good tips and be inspiring! Stay tuned! My new favorite kind of run! I love finding new places to run! The same trail over and over gets so boring. I also love doing 10 miles on a weekday and calling it short run! Poor Meg, that’s so frustrating! She’ll be passing those other girls in no time. I bought Kara’s book too but need to finish Kristin Armstrong’s book first! Too many running books, so little time!